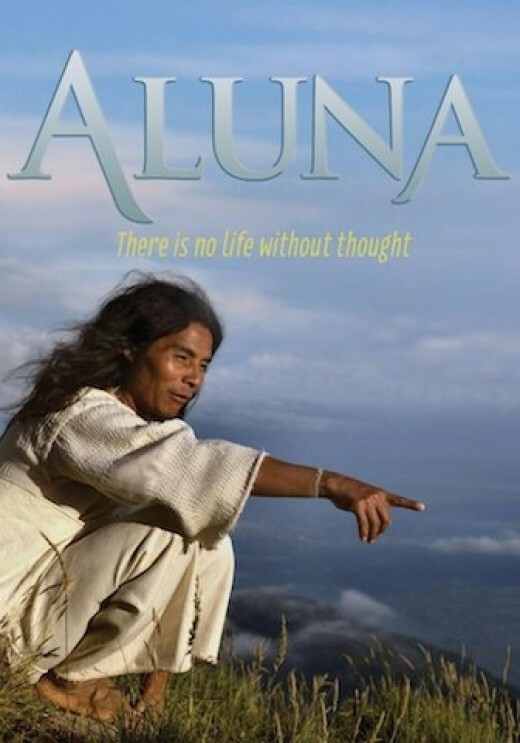 This evening I was invited to a screening of ‘Aluna’ (‘the mind inside nature’), which was followed by a Q&A session with its award winning British director and documentary filmmaker Alan Ereira. This is the second documentary film he has made with the indigenous Kogi people of Colombia. These people are desperately trying to warn us of the very real possibility of the end of the world unless we stop ruthlessly exploiting its resources. The documentary was an interesting insight into the unique lives of the Kogi people. During the time of the Spanish conquistadors, the Kogi people retreated into the high mountains of the Sierra Nevada and have lived a totally separate life from the rest of the world ever since. They have had no influence from the modern world at all. 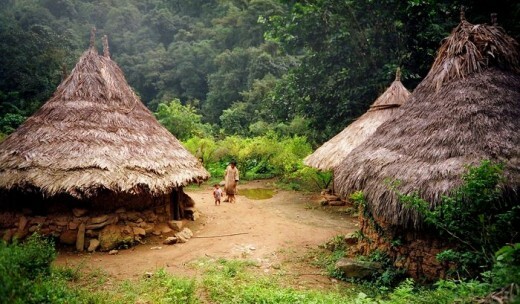 They live in huts in small villages, and there are no roads that might lead us to them. They have no electricity or running water, and they have no use for the wheel. They don’t wear shoes, as to do so would break the very deep connection they have with the earth. They have their own unique language and way of making sense of the world. They do not write or read. The Kogi people are led by Mamas, elders who learn about life through their ancestors’ teachings and by listening to nature. The Kogi Mamas ensure that their people are safe from any interaction with the modern world. Visitors are not welcome. They also teach their children about their traditional culture. In the 1980s the Kogis made contact with us through Alan Ereira with their sinister warning. They had witnessed increasingly significant ecological changes in the Sierra Nevada, and were predicting that the world was facing an imminent ecological catastrophe. This evening I heard the director speak of his experiences in Colombia. He told us that the Kogi people’s first warning had been ignored, and so they had invited him to make a second film, which is to be a final warning to us all. Eriera told us that the Kogis needed to show the ordinary people of the world what was happening to the planet because the politicians and ‘powerful’ members of the wider communities did not heed or act upon their previous warning. ‘Aluna’ was directed by the Kogi’s themselves, because the western film crew were unable to ‘see’ what they wanted to show us. They show us evidence that the world is dying because of our actions. The Kogi say that they have ears to listen to the earth, that the earth is like a body with blood and breath, and that when the water runs out we will all die. They tell us that we do not understand how the eco systems of the world work, and in the film they lead us to desecrated sacred places on the coast of Colombia where roads and power stations have been built, and sacred lagoons have been drained. They tell us that the consequences of this sacrilege will be great floods and devastation. Since the lagoons were drained, there has been heavy floods all along this coastline. They explain that the sacred places of their land are all interrelated, and that one supports the other. If one is destroyed or damaged in any way, the others will die too. The documentary is so engaging because the Kogi people take us deep into their lives and work hard to teach us what they know. However, I’m afraid that they did not have anything new to tell us. It is very sad to think that these sensitive and meditative people think that we are causing irreparable damage to the world through ignorance! Not so, we know exactly how our eco systems work. So, I’m afraid that it is us who have something to teach the Kogi. They don’t seem to understand how the rest of the world works; how the powerful are motivated by money for example, or how we manage to feed a huge and ever growing population. They may not know that in reality we accept the dreadful exploitation of our planet, which is done openly and without effective reproach. Having said that, the documentary is certainly well worth watching as it acts as a reminder of what we are destroying, and that the time to stop has arrived. It is a very delicate and fragile eco system that they describe. It is a world that our scientists do understand. Our scientists obviously know about life cycles and water, but they have no real affinity to their deep spiritual properties, and that it why they have no respect for them. At one point the Kogis tell us that we wouldn’t do these things if we could hear how the earth suffers! The western world has very little time or respect for spirituality and contemplation, and no one I have ever met claims to be able to hear the water speak warnings. The Kogi people can and we should heed them. My teenage son said, ‘I feel as though a huge stone has been placed in my heart’, when the film ended. I feel that too. Amazing responsible travel to South America travel by G Adventures.